This is usually the result of your thumb or palm accidentally grazing the touchpad. Fortunately, there are ways to combat this problem, usually by tweaking Windows' mouse/touchpad settings. If those options aren't available on your system or you're still not getting the results you want, try TouchFreeze. 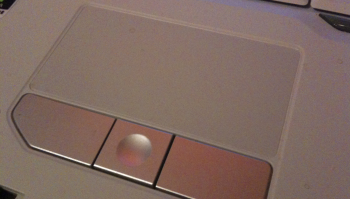 This free utility serves one simple purpose: to disable your laptop's touchpad while you type. I tested the utility on two laptops, one running Windows XP, the other, Vista. On both systems it worked as advertised: No amount of tapping while typing would actually register a tap. If you've been tearing your hair out due to flaky laptop behavior, this handy freebie may just solve the problem.